We updated Napoli font 2016 / 2017 season. We made 2 kind of font in TTF / OTF format and Vector format. 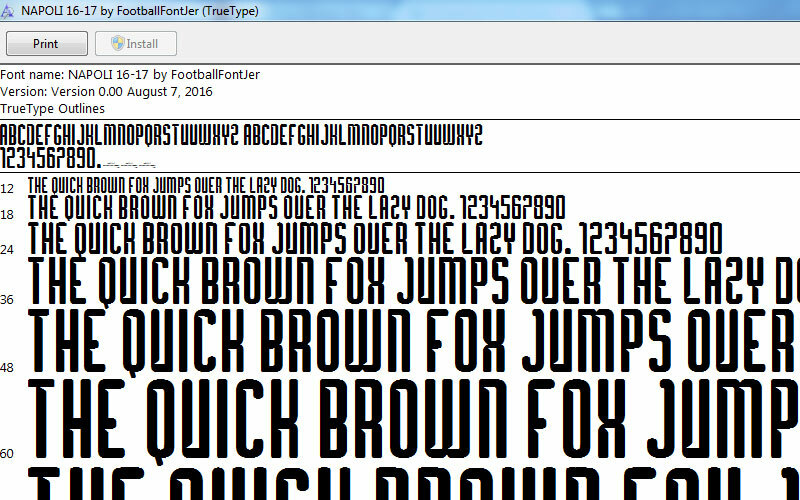 TTF / OTF format you will get number without shadow effect and logo , because TTF / OTF not supported for that. For vector format we made in PDF file , you will get number with shadow effect and logo and you must open file with vector editor application such as Corel Draw or Adobe Illustrator to edit font. We dont offer guarantee if you buy wrong format , we had describe on this post. If you didn’t get link directly after payment complete please check your spam folder or your other email. This entry was posted in Napoli, Serie A and tagged 2016/2017, Font, NAPOLI, Serie A, TTF, Vector.